Winner High School FFA members highlighted events this past year at a sponsor’s banquet held Saturday at the Tripp County 4-H Center. It was FFA’s way of showing their appreciation for sponsors and supports. The evening started with a meal, followed by talks and ended with a pie and labor auction. Luke Hennebold explained the summer ag program which culminated in showing animals at the Mid Dakota Fair. Heather Rowe talked about the Washington Leadership Conference. Five members of the local chapter attended. Daesha Klein explained the Run for a Reason which was held this summer. This was a 5K and a 10K with proceeds going to help a family who lost their home in a fire. The added twist to this run was that it was turned into a color run. Katy Lantz described the global youth institute held in Des Moines, Iowa. Alex Schaeffer reported on the events at the national FFA convention in Indianapolis, Ind. Seventeen Winner FFA members attended. Ryder Mortenson told of local students who ran for District 4 FFA office. Elisabeth Duffy and Tanner Moeller reported on the successful fruit sales. With the fruit that was left over 23 boxes were given to area families. Matt Hartley reported on the war on hunger and the challenges the participants faced. 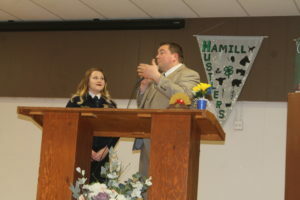 Abigail Pajl reported on the local event for FFA Week. Justus Gregg explained the details of the state convention in Brookings and outlined the awards the Winner chapter received. Advisor Wyatt DeJong gave an overview of the FFA year. He noted there has been wonderful support from the community. 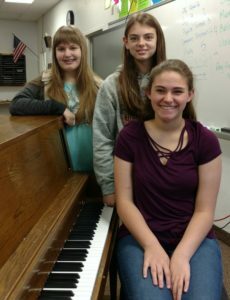 Three Winner piano students earned a perfect 1+ (superior plus) at the recent piano contest in Gregory. The Winner 8th grade girls with the perfect score are Adrienne Lewis, Marissa Meiners and Hattie Hespe. Other Winner area students participating in the piano contest were: Emily Sachtjen, Justin Hausmann, Amanda Blare, Brooke Burns, Jed Blare, Lena DeMers, Livvy Audiss, Maggie DeMers, Arnolla Duffy, Andrew Henderson, Emma Vandenbark, Ainsley Henderson, Leah Wiechelman, Faith Covey, Katie Welker and Maya Vandenbark, High marks were earned by all. Piano teachers for these students are Danielle Catoe, Michaela Johnson, Carol Peterson and Jan Ringstmeyer. 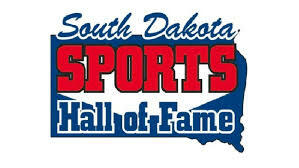 Blanche Barnum, who taught in Winner in 1925, is a 2018 South Dakota Sports Hall of Fame legends inductee. Winner was her first teaching and coaching job. She taught English and coached basketball before moving to Mitchell where she coached the rest of her career. She died at the age of 94. Barnum graduated from the University of California in Berkley. She played tennis for California which only had around 7,000 students at that time. She also worked for the Berkley recreation department. After receiving her degree in health and physical education and a minor in English, she accepted her first job in Winner. Barnum played golf until she was 90 and played tennis until she was 83. Barnum taught all levels in the Mitchell School District from 1951 to 1969. Before Title IX existed, Barnum had formed Girls Athletic Association while teaching physical education at the middle school in Mitchell. In 1960, she was named the supervisor for physical education in the Mitchell School District. 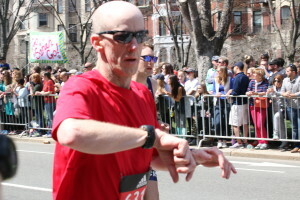 Guy Collins, son of Vern and Paulena Collins, Witten, ran his second Boston Marathon in 3 hours and 19 minutes. Collins is a 1985 graduate of Winner High School. Collins has run in over 100 half marathons in every state in the United States and two foreign countries. Outdoor weather has not been kind to the Winner track team so they took their action inside. The team took part in the Wesleyan Open on the campus of Dakota Wesleyan University in Mitchell on April 16. Due to the snow and cold, the Winner team has not able to compete much outdoors. The DWU Avera Sports and Wellness Complex provided an indoor place to compete. Winner’s Ellie Brozik won the 200 in :27.34 and Sidda Schuyler won the 3,200 in 12:35.90. Schuyler also placed second in the mile run in 5:36.67. Kelsey Sachtjen placed first in the high jump with a leap of 4-11. 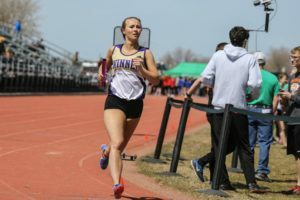 The girls team won two relays—4×400 and medley. For the Winner boys, Brady Fritz won the triple jump (41-2) and placed second in the long jump (20-4). Fritz also placed second in the 200 in :23.87. Kade Watson won the 3200 in 10:53.05 and the boys medley relay took first place. 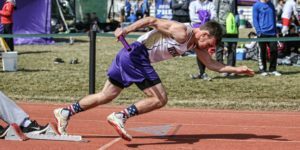 Brady Fritz won the long jump at the Pierre Legion Relays on Thursday. Fritz finished with a leap of 21 feet-4 inches edging out Rapid City Central’s Kailleb Walton-Blanden for first place. Fritz qualified for the state track meet in the long jump. Also qualifying for state were the boys 4×100 relay and Kelsey Sachtjen in the high jump. There were over 20 high school teams at the meet. This included some of the larger schools in the state from Sioux Falls and Rapid City. Long jump—Fritz, 1st, 21-04; Riley Calhoon, 15th, 18-10.75; Joren Bruun, 31st, 17-06.50. Funeral services for Opal Ann Boes were held April 21 at Grace Lutheran Church in Burke with Pastor David Schmidt and Pastor John Schwartz officiating. Burial will be in the Herrick Cemetery at a later date. 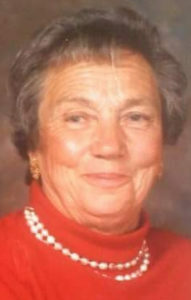 Opal Ann Boes was born Aug. 19, 1930, at St. Charles, South Dakota to Darwin and Fern Wilson. She passed away quietly, holding her son’s hand, at St. Mary’s Hospital in Pierre, South Dakota at 4:09 p.m. on April 13, 2018 after a courageous battle with health issues. Opal was the middle child of three and grew up on a farm south of Herrick, South Dakota. She was a member of Grace Evangelical Lutheran Church in Burke, South Dakota and was confirmed and baptized at St John’s Lutheran Church in Herrick as a child. At the age of 15, she met Naven Boes at a dance in Herrick, they dated for one year. They were united in marriage on Dec. 13, 1946 at the Naper Lutheran Church in Naper, Neb., in front of their witnesses Art and Erma Boes. This love would remain and sustain them for the remainder of their lives. To this union seven children were born. They would live on several farms within the Burke area prior to purchasing the Boes family farm from Naven’s parents in 1961. There they continued to live and raise their children until Naven’s death on Sept. 13, 1999. After his death, she sold the farm and moved to Gregory, South Dakota for a short time before moving to Ft. Pierre, South Dakota in 2002. She worked at the Community Youth Center until suffering a stroke, while working in 2009. Some of Opal’s favorite activities included dancing with Naven, as they spent many nights gliding across a waltz floor as their children watched. She loved listening to music, especially Daniel O’Donnell and Lawrence Welk. She enjoyed hosting card parties for the neighbors and was always willing and able to play a hand of six point pitch or checkers at the drop of a hat with her grandchildren. She loved spending time with her children, grandchildren, great-grandchildren and any other child. Nothing would bring a smile to her face faster than a visit from a young person. She enjoyed all of her grandchildren’s sporting events, graduations, marriages and proms, and loved watching her favorite Chicago Cubs. During her years on the farm she was known to raise large gardens of vegetables that she would use to feed her family or to sell. Acres and acres of tomatoes, cucumbers, watermelons, muskmelons, and onions. She also raised and butchered hundreds of chickens each year. She worked side by side with Naven, but was known for always having a chocolate brownie and cup of coffee ready for her family or guests. Opal was preceded in death by her husband, Naven; her daughter, Joyce; her grandson, Steven; her great-grandson, Stetson; her parents, Darwin and Fern; her step-mother, Olive; her sister, Dorothea, her brother, Edwin; her in-laws, Jacob and Hulda Boes; 9 brothers-in-law and 5 sisters-in-law. Opal is survived by her children and their spouses: Twila (Kenny) Combs of Dallas, SD; Bradley (Elaine) Boes of Rapid City, SD; Lorna (Richard) Whiting of Gregory, SD; Krista (Steve) Cerny of Rapid City, SD; Douglas (Candi) Boes of Ft. Pierre, SD; Timothy (Jen) Boes of Johnston, IA; her son-in-law, Sonny; 21 grandchildren, 24 great-grandchildren and 3 great-great-grandchildren; as well as many other relatives and friends. Lawrence County state’s attorney John Fitzgerald wants to be South Dakota’s next attorney general. Fitzgerald was in Winner on April 9 for the Lincoln Day dinner. He is one of three Republicans seeking the party’s nomination as attorney general. Current attorney general Marty Jackley is running for governor. Fitzgerald says he has the level of experience that sets him apart from the other candidates for attorney general. He says he has the determination for serving justice and helping people. 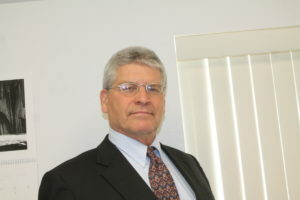 Fitzgerald received his undergraduate degree in history from Black Hills State University in 1977 and his law degree from the University of South Dakota in 1979. The candidate has been a prosecuting attorney in South Dakota for 38 years. He was elected state’s attorney in Butte County and then became a special state’s attorney in Lawrence County, working half time in each county. Since 1995, Fitzgerald has been the Lawrence County state’s attorney. Originally from Boston, Fitzgerald explained his background as the oldest son of Judge John Fitzgerald. He explained that his family was affected by an attempt on the life of his father and how the mafia tried to kill his father. His father was a criminal defense attorney in Boston who was representing people that work for the mafia. Fitzgerald said he was 12 years old at the time. His father crossed the mafia and they decided they were going to kill hm. They planted a bomb in his car and when he started it the bomb went off blowing off the attorney’s leg and maimed his other leg. His father survived and agreed to testify against the mafia. The government got the older Fitzgerald a job with the Small Business Administration working with disaster relief. The elder Fitzgerald came to Rapid City after the 1972 flood. He liked the area and moved his family to western South Dakota. Fitzgerald and his wife, Mary, have been married for 39 years and have three grown children and five grandchildren who all live in South Dakota. 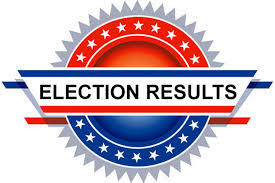 Absentee voting for the June 5 South Dakota primary election started on Friday, April 20. Registered voters can vote in person at the county auditor’s office. Persons must bring a photo ID to vote. Voters wishing to vote absentee by mail must fill out an absentee ballot application and have their signature notarized or provide a copy of their photo identification. Voters must mail or return this application to the county auditor. If mailed, persons must make sure the ballot arrives by election day. Big changes may be on the way for football and wrestling after the first reading of handbook proposals at Monday’s meeting of the South Dakota High School Activities Association. Among the many handbook changes considered were the advent of six-man football and the addition of a dual title to the state wrestling tournament. Starting in the 2019-20 season, six-man football would replace the 9B classification, leaving only two classifications of nine-man football. The new classification would be open to any school with an average daily membership of 40 or fewer male students. That number was too high for Jay Wammen, head football coach at Harding County. Wammen said he knew that some coaches would field a six-man team with 30 players on the sideline just so they could have a “powerhouse six-man team.” He suggested the number be cut to 25. Wammen also noted that six-man football doesn’t offer players the full range of experience they would need to go on to play football in college. 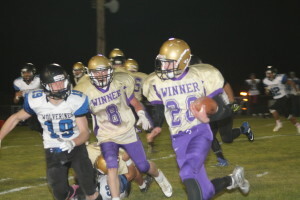 “We hope a lot of our kids get to play at the college level,” Wammen said. SDHSAA Assistant Executive Director John Krogstrand said the decision to use the average daily membership of 40 was designed to be more inclusive. Board member Sandy Klatt of Brandon Valley asked if the advent of six-man football would mean the dissolution of some football cooperatives. Krogstrand said that might happen, but it would be the only way that some small communities could get back to hosting high school football games. “They can have their Friday nights back home,” Krogstrand said. The board approved the first reading of the creation of six-man football on a 5-2 vote. Board members Dave Planteen of Baltic and Steve Morford of Spearfish cast the dissenting votes. Krogstrand said wrestling coaches have been hopeful that the dual tournament would be reinstated. Getting it right was the subject of a lengthy debate. The original proposal called for implementing the tournament during the next school year. Some athletic directors in the room, who already had their dual schedules set for next year, balked at making the change so fast. “I feel like we’re trying to build the airplane while we fly it,:” said board member Brian Maher of Sioux Falls. The motion that passed unanimously called for implementing the tournament in the 2019-20 school year with SDHSAA staff tasked with figuring out how teams would qualify for the tournament. In addition to the athletic handbook, first readings were also held for changes to the fine arts handbook. One of those changes included a major change for show choir. SDHSAA Assistant Executive Director Brooks Bowman said each year fewer teams are taking part in show choir. The change approved Monday would discontinue the State Show Choir Competition to have it eventually replaced by an All-State Show Choir. “We would not sponsor show choir next year,” Bowman said, explaining that the show choir advisory board is working on the details for the All-State event. The handbook changes will have their second and final reading at SDHSAA’s June meeting.